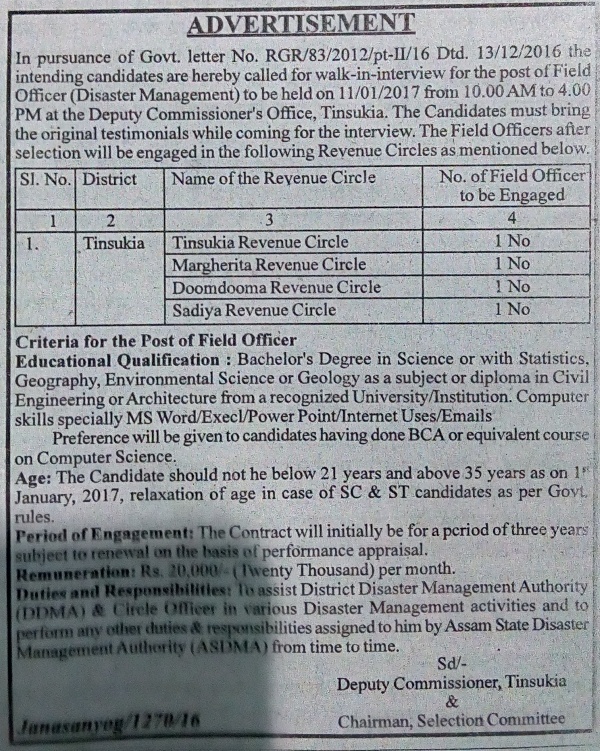 Intending candidates are hereby called for appearing for Walk-in- Interview for Field Officer (Disaster Management) for Revenue Circle on contract basis under District Disaster Management Authority, Tinsukia to be held on 11/01/2017 from 10:00 am to 4:00 pm in the Deputy Commissioner's Office, Tinsukia to be engaged in various Revenue Circle of Tinsukia district. Age: 21 to 35 years as on 1st Jan 2017. How to apply: The interested candidates may report to the office of the Deputy Commissioner, Tinsukia, at 10 AM, 11th January 2017 with all relevant testimonials.